Whether your front desk team consists of veterans, newbies, or a combination of both – you can have top-notch success-focused front desk training sent right to your door! The front desk is the gateway to new patients, production, referrals, and everything else. When the front desk staff is well trained, the office takes a huge turn for the better. The Madow Brothers have distilled many years worth of front desk knowledge into ten easy-to-use modules that are guaranteed to build your practice like never before! No – we didn’t think so. But that’s okay, because everything is about to change! Finally – whether your front desk team consists of veterans, newbies, or a combination of both – you can have top-notch success-focused front desk training sent right to your door! The front desk is the gateway to new patients, production, referrals, and everything else. Make sure yours is running on all cylinders! New patient numbers go up! Team morale gets an uplift! And everyone – docs, team and patients – loves the practice more! The answer is an easy one, and it’s not buying an expensive new piece of equipment, learning a high-end procedure, or dropping an insurance plan. And it’s certainly not adding evening hours or redecorating! The answer is to make significant improvements where all the action is – the front desk! The fact is, the front desk is the portal to everything that goes on in your practice. It’s ground zero, command central, the heart and soul, the epicenter……it’s where everything begins that translates to happy patients, a productive office, and more money in your pocket! But sadly – too often front desk team members lack the training to really do the job well ….and the entire office suffers. Not that this person doesn’t WANT to do a good job, it’s just that no one ever showed them how to in a step-by-step manner. And then they train the next employee and the cycle continues. That’s right, for the first time ever, we have distilled many years worth of front desk knowledge into ten easy-to-use modules that are guaranteed* to build your practice like never before! And best of all, you can have it delivered right to your door! It’s about time you had the front desk team you deserve. And best of all, your staff will now love going to work every single day knowing they are well-trained, top-notch and helping the practice to produce! You can now have all of the modules – ten of them containing our most powerful, tested, front desk practice building secrets – delivered right to your door!! 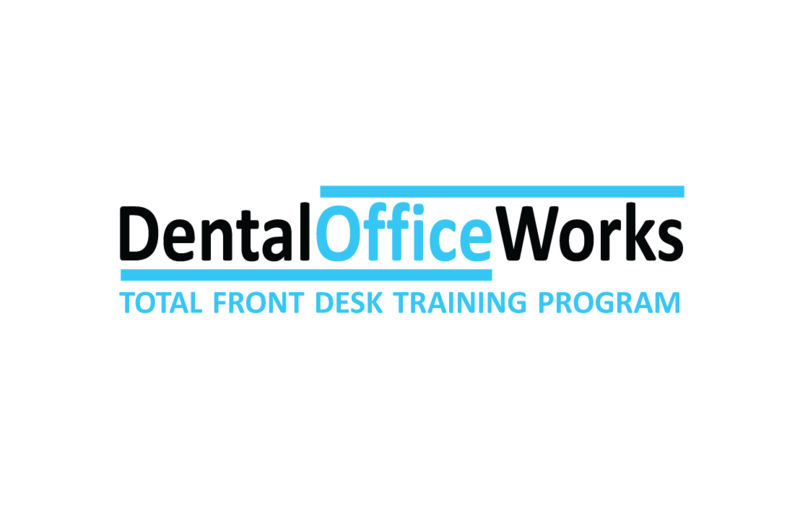 Here is the full list, module by module, of what is included in the Dental Office Works “Total Front Desk Training Program” by The Madow Brothers! MODULES #1 and #2: Profitable Dental Scheduling! Why most dental practices schedule fewer than 10% of potential new patient calls, and how to turn that number around forever! How much a new patient is truly worth. This is eye-opening! “How much do you charge for a cleaning?” Finally learn how to turn dreaded questions like these around in your favor! An easy to follow six-step flow chart for handling even the most difficult callers! How to impress every patient in the first two seconds of every phone call! A simple skill to double, triple or even quadruple the amount of new patients from a single phone call! The information contained in these two modules alone is worth more than the price of the entire package. But of course there’s much more! MODULE #3: Reduce Cancellations and No-Shows Now! You can actually reduce cancellations by 90% using this simple three-step process! You work hard to fill that schedule – now you’ll learn many more ways to keep it full!!! Like it or not, dental insurance is here to stay. And it is one of the most frustrating things front desk team members deal with on a day-to-day basis. This module unravels the secrets of dental insurance so that even a brand new team member can jump right into the fray with powerful knowledge and strategies! Unlike most of the confusing gobbledy-gook out there, this information is extremely user friendly and valuable for veterans and newbies alike. Isn’t it time that your front desk team masters the insurance game once and for all? Now you finally can! MODULE #6: Collect 100% – 100% Of The Time! How dangerous is it to miss collecting just a few percent? These figures will open your eyes and get you more serious about collecting! Why collecting begins and ends at the front desk – and how to keep it there! The number one rule of collections – break it at your own risk! The three forms of payment every office must offer! What to do when a patient gets turned down by Care Credit. This works every time! The biggest mistake team members make (without even knowing it) when it comes to collections. Here’s the remedy! Many more tips and secrets to collecting what you produce! MODULE #7: How To Handle The Difficult Patient! How to spot a difficult patient before they get out of hand! An easy way to disarm the patient even if they are 100% wrong! The number one scenario that can turn anyone into a difficult patient. Here’s how to avoid it! Follow this flow chart and watch even the toughest patients melt right before your eyes! One thing you should never do under any circumstances! It’s a “no-win,” and everyone does it!! Many more tips for taming the toughest patients! MODULE #8: Hit a Home Run With HR – Human Resources! The number one HR issue in every dental practice. Not knowing this could cost literally millions of dollars! What are the rules for termination? Does an employee really have to be present? What is in the employee handbook? Do we really need one? The pitfalls of having a spouse working in the office. It may be more than you may think! How can the front desk person help reduce worker’s comp insurance? MODULE #9: Say This – Not THAT! MODULE #10: The Top 20 Telephone Tips and Techniques! The number one telephone mistake that practically every practice makes. It lowers production big time. Good news – it’s easy to remedy when you know how! What to do if you are on the phone with a patient and have to grab another line. They will love you for it! How to handle someone who insists on speaking to the doctor! Three words you should never say – and what to stay instead! The tip from a high-end restaurant maître d’ that you can easily use in your practice. Why not give five star service every time? Many more fantastic telephone tips! Wow – that’s a lot of stuff! Ten complete modules!! It’s impossible to believe that anyone who puts even a few of these things into action wouldn’t be part of one of the best front-desk teams in the country! This is the first time in the history of dentistry that a front desk training program like this has been available! Okay – so here’s the question. How much will it cost to get all of this practice building, life-changing information sent right to your door? First, please consider this. How much would it really cost you to hire a “practice management consultant” (probably not even a dentist) to come to your office to teach this kind of stuff? It would be at least ten thousand dollars plus travel and follow-up. Heck, we (The Madow Brothers) used to charge twelve to twenty thousand dollars to visit a practice for just one day! But now you can have a HUGE box of the best front-desk training in dentistry sent right to your door without skipping a beat! That’s right, for a limited time you can experience the brand new Dental Office Works “Total Front Desk Training” in the comfort of your home or office! The Complete Handbook of Dental Terminology for Front Desk Teams! It’s a complete listing of all the terms a front desk team member needs to know, both clinical and administrative, written in an easy-to-learn fashion. Learn these and never be stumped again! The entire package, all ten modules AND the amazing bonus item we described, (a $7500.00 value!) can be yours for just $697.00! Order today. Until the “END-OF-THE-YEAR”, deduct $400 from the price, making your total price only $297. If this was a great deal before, we just made it into the biggest no-brainer the year!!! If ordering online, please click below. Remember – a new patient is worth thousands of dollars to your practice, and with the Dental Office Works Total Front Desk Training Program you will be getting tons of them and more! Now it’s up to you. Are you ready to make this the year that your practice finally explodes with growth? Are you ready to have a front-desk team that totally “gets it” and treats the practice as if it is their own? Do you want your income to increase to the level you deserve? There has never been a front desk training program like this in the history of dentistry! Now is the time to have your practice live up to its true potential. You have ONE FULL YEAR to find out if this information will give your practice the most amazing front desk team ever. If not, just send it back for a full 100% refund. You even get the amazing 100X guarantee! No one else in dentistry can make a guarantee like this. Why do you think that is? For over twenty-five years The Madow Brothers have been “The Voice of Dentistry!” Now is the time to find out why! Call 1-800-258-0060 and see what so many of your colleagues already know when it comes to practice growth, happiness, and earning more money in dentistry! DON’T WAIT!! SPECIAL OFFER IS ONLY GOOD FOR A LIMITED TIME!!! Order by today and deduct $400 from the price, making your total price only $297. If this was a great deal before, we just made it into the biggest no-brainer of the year!